For over fifty years, Samaritans of Dundee has been there for people who are in distress and in need of someone to talk to and non-judgemental, unconditional support. Opened in 1962, our branch now has 50 volunteers offering round the clock support via telephone, email, text message and even face-to-face, to anyone who may be struggling to cope. What is remarkable is that the service is delivered entirely by volunteers, with over a 1000 in Scotland joining the 20,000-plus members across the UK and the Republic of Ireland. The charity is always looking to recruit more volunteers to help us continue this crucial service, and Samaritans of Dundee is no exception. Our volunteers are the lifeblood of Samaritans, and each member of the branch plays a vital part in helping us to support people who are struggling, from those answering the phones, texts and emails, to those who help us by raising money for us at local events and promoting our work in the community. We are a charity, and we hold those people who support us, in many, many wonderful ways, very close to our hearts indeed. Some of our Samaritans are non-listening support volunteers, and these lovely people help keep our service living and breathing by taking care of our finances, building maintenance, and even kindly making sure that we have teabags, coffee and the ever-essential biscuits for the times that we are on shift, listening to our callers. However, when the phone rings, the coffee goes cold and the tea is forgotten . . . The callers and the calls are what we are there for. Our trained volunteers are ordinary people from all walks of life; they listen and, because our service is totally confidential, it allows our callers to talk about things that they might be too worried about to share with friends or family. They appreciate a safe, non-judgemental environment to explore their options and how they feel – without having to worry about upsetting the other person. For many of our callers we are a sounding board, a place where they can ‘test-run’ their lead up to conversation that they need or want to have. Sometimes, the callers talk to us about events, feelings and subjects that they have never talked about before and may never mention again, but for many people who contact Samaritans, knowing that they have someone they can talk to helps. For many of our callers, we can be the first port of call when they are feeling low. By giving them the time to talk, they can sort through their feelings and find a way forward that is right for them. Some callers contact us when obstacles, hurts and and painful events have taken a toll on them, but in talking to us, we always hope to reassure them that we are there for them – no matter what . . . Although best known for offering a 24 hour helpline, Samaritans’ work extends beyond the branches. Dundee Samaritans support a Prison Listener Scheme at HMP Castle Huntly, training prisoners to become Listeners, so that they can offer confidential support to fellow inmates. Samaritans also head out into the community with ‘Feet on the Street’. We visit shopping centres, supermarkets, community centres, wellbeing fairs, make ourselves available outside nightclubs – and basically anywhere else we are invited to attend or feel that we might be of some use. We have had stalls at freshers’ fairs and colleges and universities, visited with rotary clubs and rural groups, and we have spoken with university groups and societies. Our talks team are always happy to respond to invitations and are always so well looked after by our hosts! Spreading the word that we are here to support people in distress is so important to us, and our national and local campaigns reflect this. Our Talk To Us campaign, which runs annually throughout July, is as genuine and as straightforward as it sounds. We are encouraging people to talk to us. We want to let people know that anyone can contact Samaritans, whoever they are, however they are feeling, and whatever life has done to them. They can talk in confidence by phone, email, text or face to face, about whatever’s troubling them. 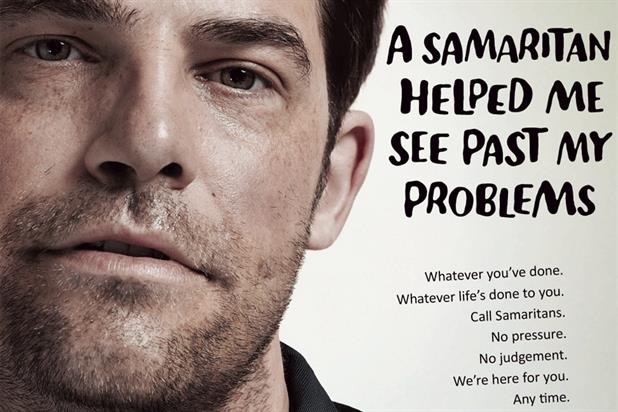 You don’t have to be suicidal to talk to Samaritans . . . Everyone struggles at some point, or feels overwhelmed by what’s happening in their lives. It can feel difficult to talk, even to people you feel close to. Our volunteers are here to listen, round the clock, every day of the year, to help you work through your problems. It might be a life-changing event like a relationship breakdown, redundancy or bereavement. But work, study, family, friends, finances, housing, health, sexuality and loneliness are just some of the things you can talk to us about. You can talk to us, and we will listen. During July, on the 24th of the 7th month, we also take the opportunity to remind people that they can talk to a Samaritan 24/7, that is every hour of the day and night, every day of the year . . . There is always a Samaritan there to take your call. So please phone. Talk to us . . .
You can contact Samaritans at any time of the day or night by calling 08457 90 90 90 or contacting Dundee Samaritans on 01382 832555. You can also email Samaritans via jo@samaritans.org. 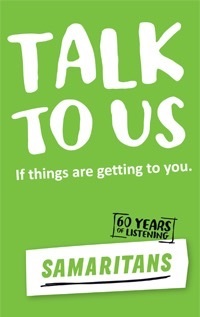 If you would like to learn more about Samaritans, their work and their campaigns, visit www.samaritans.org. If you are interested in volunteering with Dundee Samaritans, we would love to hear from you. Contact the Dundee Branch on 01382 832555. Jo Ahern is the Chairperson at Samaritans of Dundee. This entry was posted in Uncategorized and tagged confidential, helpline, mental health, samartians, volunteer. Bookmark the permalink.